Newspapers, magazines, radio, and television are collectively known as "the media industry". Can they benefit from this new craze called "texting"? Absolutely! Just as a restaurant or a retail store can incorporate SMS campaigns into their marketing mix, so can radio stations, TV stations or networks, newspapers, and magazines. They can strengthen their relationship with their readers and viewers, and boost their overall popularity by involving the audience with interactive text messaging promotions. The younger crowd uses their phones to "chat" all day long. With a little extra equipment, chat screens can be added to a television show. Imagine asking the audience to send requests for music or opinions on the characters. You could easily increase the size of the audience because the participants would quickly spread the word to their friends. The same technique could be added to news and sports shows for a broader audience participation. In this fast-paced world where TV and radio may be slipping in audience size, you could actually boost your brand and popularity. Just look at the phenomenal success of American Idle! What about the print media? Live chat doesn't seem to fit in very well. But it does. Very similar results can be achieved by utilizing Text-To-Keyword campaigns. Write exciting headlines that invite the reader to read more in order to learn how they can win a special prize, or vote, or give their opinion, or participate in a poll. You ask them to text a keyword to your short code (12345) with their answer or to enter the contest. Remember, in all of these examples, you have now captured the phone numbers of all the participants, and you can send them new messages in the future. That way you can remain in contact with them and continue to build your relationship with your audience. Whether it's television, radio, or a newspaper, you could blast weather alerts, breaking news stories, sports news, show times, or coupons, and embed your name in their minds just like McDonalds and Coke have. You can also put a form on your website and invite people to sign up for these various text messages while visiting your site. 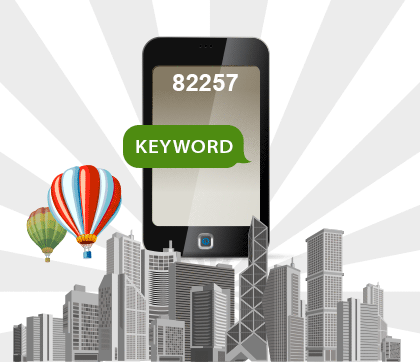 By offering SMS services like Text2Keyword, Voting and Polling, Contests, and Text2Screen to your advertisers, you can create new income streams for your company. And with our detailed reports, you can also provide your clients with valuable data that shows the effectiveness of their ads. This tactic can put you miles ahead of your competition, strengthen the loyalty of your current advertisers, and easily attract new clients. Texting is here to stay. It's only growing in poularity - especially with the young adult crowd - and you should be taking full advantage of it. As the old saying goes, "If you can't lick 'em, join 'em." It couldn't be more appropriate than under these circumstances.